Stick a decorative letter 'X' monogram on each piece of mail for a classy finishing touch! Whether it represents your unique last name or holds some other special significance, this dashing design will make your letters and packages stand out with style. The symbol is surrounded with eye-catching scrolls that add sophistication to this selection. But the biggest benefit of this product is the convenient, self-adhesive backing. No more scribbling out your return address. Just peel and place and you're done! 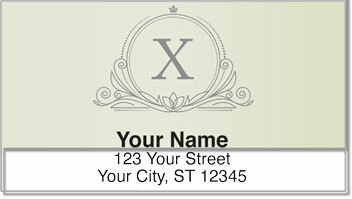 Get your own X Monogram Address Labels today! Make it complete when you also order matching checks.